It's a first: researchers have built the first artificial-heart-like pump that is powered by microbial fuel cells fed on human urine. But instead of being used as a prosthetic device for human patients suffering from cardiac failure, the pump is intended to be used in "EcoBots" that extract energy from organic waste and turn it into electricity. The researchers, from the University of the West of England and the University of Bristol, both in Bristol, UK, have published their paper on the biologically inspired, urine-powered pump in a recent issue of Bioinspiration & Biomimetics. The group's research into microbial fuel cells fed on urine is one of the many diverse projects receiving funding from the Bill and Melinda Gates Foundation. The researchers have already designed and fabricated several varieties of EcoBots. These robots are energetically autonomous, meaning they generate their own energy, in this case using onboard microbial fuel cells (MFCs). In the MFCs, live microbes digest organic feedstock and then produce electrons that are transferred to an electrode, causing a chemical reaction that generates electrical energy. The EcoBots have demonstrated that they can successfully use a variety of organic feedstocks such as rotten fruits and vegetables, dead flies, waste water, sewage sludge, and human urine. The energy produced by the EcoBots from this waste could then be used for low-energy environmental sensing tasks, such as monitoring air quality and pollution levels. A vital component of the EcoBot design is a pump that delivers the liquid organic feedstock to the chambers in the MFCs containing the microbes and electrodes. The pump also supplies fresh water to hydrate the electrodes. In the EcoBots built so far, electric motor-driven pumps have been used for fluid circulation. However, electric motor-driven pumps are complex and prone to mechanical failure. In the new paper, the researchers' goal was to investigate the potential to replace the motor-driven pump with a biologically inspired pump made of "smart" materials that move more like muscles than like motors. To do this, they modeled their pump on the human heart and built it with compressible materials, NiTi fibers as artificial muscles, rubber balls as artificial heart valves, and silicone tubes as artificial arteries. The rigid parts of the body of the pump were fabricated by a 3D printer, while the soft compressible section was cast in silicone using 3D printed moulds. The pump operates very similarly to a human heart. Before starting, the hollow body of the actuator is manually filled with fluid in this case, the researchers used water or urine. Then an electric current is applied to the NiTi artificial muscle fibers. The current heats the fibers and causes them to contract, which compresses the hollow body of the actuator and pushes the fluid out through an outlet tube. When the electric current is removed, the artificial muscles cool and relax, causing the body to expand again. As this cycle repeats, it simulates the rhythmic contractions of a biological heart. During each contraction, or actuation, fluid is pumped out of the actuator at a height that would be sufficient to deliver fuel to an EcoBot's fuel cells. The researchers calculated the efficiency of the heart-like pump to be 0.11%, which is significantly lower than the 0.79% efficiency of an electric motor-driven pump. However, as the researchers noted, motor-driven pumps have been developed and refined over several decades, while this actuator is the first proof-of-concept prototype of its kind. In the short term, the researchers expect that further improvements can be made in a few ways, such as by minimizing hydrodynamic losses due to friction, creating a smoother transition between the pump body and outlet port, and decreasing the weight of the hollow body by reducing the wall thickness. In the longer term, it is expected that the efficiency of artificial muscle materials may improve. The researchers also demonstrated the potential for this heart-like pump to be used to circulate fluid for the MFCs on a future MFC-powered EcoBot. In such a system, a stack of 24 MFCs would charge a capacitor which powers the pump which is then used to pump fluid through the MFCs. After an initial charging period of 12 hours, the capacitor provides enough energy for the pump to transfer 27 ml of fluid, and can then be recharged in about 2.5 hours. Even though it is the first prototype, this system meets the current EcoBot's daily fluid pumping requirements. And because the internal orifices of the heart-like pump are larger than in the conventional electric-motor driven pumps employed previously on the EcoBot, the researchers hope that it will be less likely to become blocked. 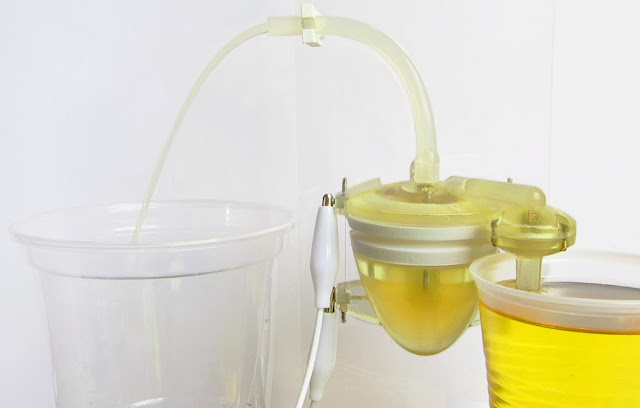 The researchers envision a future urine-powered EcoBot that harvests energy from waste collected from urinals at public lavatories, and then uses the harvested energy for environmental sensing. A number of EcoBots could form a distributed sensor network within an urban area. The heart-like pump also has the potential to be used for a variety of industrial, scientific and medical applications, such as coolant circulation or wearable drug delivery. The soft pump has the advantage of operating with much less noise than a motor-driven pump, which could give it certain niche applications. And because the EcoBot's ability to turn waste into electricity is such a captivating concept, the researchers think that the artificial heart-like pump could help increase public awareness of research in biologically inspired robots. They imagine, for instance, that a cyborg-like machine with an artificial heartbeat would attract the interest of a new generation of scientists, artists, and engineers. The researchers are also working on improving the efficiency of the device, with the aim of incorporating it into the next generation of MFC-powered robots.